The Computer Collection contains an assortment of photomicrographs illustrating the various parts that may be found in everyday computers. However, items such as microprocessors, compact disks, and hard drives are relatively recent developments. Early predecessors of modern computers, such as the slide rule and abacus, were simple devices that did not contain such an array of components. Yet, each of these early computing devices represents a primitive form of one of the two basic kinds of computers familiar today, analog and digital. The slide rule, for instance, is comprised of graduated scales mounted so that their relative movement enables simple calculations to be carried out via mechanical means. Since the device represents numbers by variable physical quantities rather than by discrete digits, the slide rule works by the same basic principle of more advanced analog computers. The abacus, however, enables calculations through the manipulation of counters whose positions indicate discrete numerical values. Similarly, modern digital computers, which are commonly referred to simply as "computers" today since they have come to be the dominant technology in the field, essentially function via the manipulation of discrete binary digits (1s and 0s). Despite its relation to early mechanical calculating devices, the modern computer is often credited with first being conceived by Charles Babbage, an English mathematician, in the 1830s. The calculating machine he designed was never successfully built in his lifetime, however. Approximately a century after Babbage's attempts, the first general-purpose analog computer was constructed by Vannevar Bush, an American physicist and engineer, who called his invention a differential analyzer. The earliest known semielectronic digital calculating machine appeared shortly thereafter in 1939, the same year that Howard Aiken of Harvard University began developing the Mark I calculator, a pioneering fully automatic device. The subsequent decade saw the completion of the Electronic Numerical Integrator And Calculator (ENIAC), which is recognized as the first all-electronic universal digital computing device. Built by and for the United States Army, ENIAC was a behemoth compared to modern machines, containing more than 18,000 vacuum tubes, weighing approximately 30 tons, and occupying a large room. The Universal Automatic Computer (UNIVAC), which was a successor of ENIAC built by the same team, became the first computer sold for commercial use and utilized a metal tape input system rather than the punch card system of earlier machines. In the early 1950s, after UNIVAC became available, there were only about 100 computers in operation worldwide. By the year 2000, 54 million households in the United States alone contained one or more computers. What is perhaps even more astonishing is the fact that these machines had more capacity in a single silicon chip than the entire ENIAC system that was such a crucial step along the way to contemporary computers. A host of technological advances are responsible for such a drastic change in capability and for making computers feasible for personal use. 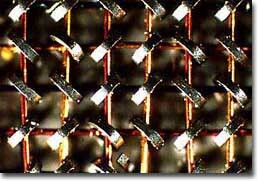 A computer's memory in the early 1960s, for instance, was typically a ferrite core memory, an architecture that relied on the magnetization of small iron ferrite doughnuts (ferrite cores) to store information. Depending upon the direction of the energizing current, the cores would become magnetized in either a clockwise (0) or counterclockwise (1) direction. When reading the value of the core, the direction of the current was used to determine whether the value of information held by the core was 0 or 1, the binary information used by the computer. 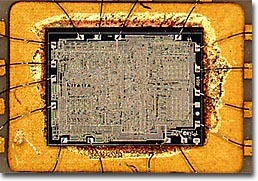 The development and subsequent improvements of the integrated circuit, however, revolutionized computer design. Indeed, in former times, each ferrite core represented one digit, or bit, and the total memory of a computer was considered in terms of thousands of bytes (kilobytes), while contemporary semiconductor devices correspond to millions of bytes, or megabytes, and the total memory of a mainframe may be measured in billions of bytes (gigabytes). In addition to saving data in a computer's main storage, information and programs can be retained externally. Cards with punch marks and paper tape were once the primary means of such storage, but more advanced materials, including magnetic tape, magnetic disks, and optical disks, are now widely available. 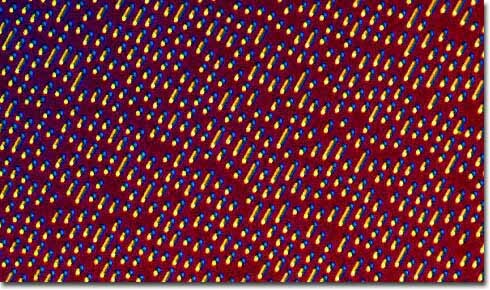 Unlike semiconductor memory, these alternative types of memory storage do not lose their data when a computer shuts down and provide a practical way for transferring data between machines. Each kind of external storage differs slightly, however, from the other types. Magnetic tape and magnetic disks, for instance, can both be read from and written to, but information can take longer to access on a tape if the needed data is not near the beginning than it will to retrieve it from a magnetic disk, in which the data is conveniently organized into tracks on the disk's surface. Optical disks are arranged in a manner similar to magnetic disks, but vary in their ability to be read, written, and rewritten. 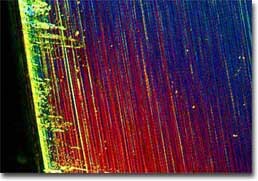 A CD-ROM, which has an appearance identical to the rock band Bon Jovi's Slippery When Wet audio compact disk that appears in the banner photomicrograph, can only be read after its has been made at the factory, similar to a DVD-ROM, which is a more advanced form of the same basic technology. CD-R and DVD-R, however, are optical disks that can be written a single time by a home computer, while CD-RW and DVD-RW technologies can be rewritten repeatedly. No matter how much auxiliary memory a computer has, the machine would not be capable of utilizing this memory without a central processing unit (CPU). Usually considered the brains or the heart of a computer, the CPU regulates the various elements of a computer system and is where most of the machine's calculations are carried out. A CPU is generally comprised of two fundamental components, the arithmetic logic unit (ALU) and the control unit. As suggested by their names, the ALU executes arithmetic and logic operations, while the control unit controls the operations by sequentially selecting and retrieving instructions from the main memory and integrating any data registered by input devices. An extremely fast clock is also involved in the activity of the CPU, timing and regulating each operation it carries out. The faster the clock of a CPU, the more expedient the computer is at completing its tasks. Early versions of personal computers exhibited clock speeds of less than 5 megahertz (MHz), but it is not uncommon for more recent models to have CPUs with 500 MHz clocks. 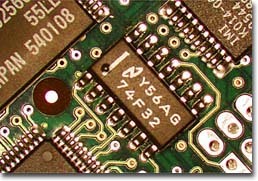 It is also important to note that the entire CPU of a desktop computer may be contained in a single chip called a microprocessor, while more powerful machines, such as mainframes, may require one or more circuit boards. A number of input and output devices have been developed over the years that have made computers more practical and convenient to utilize than they were in their infancy. One of the earliest of these devices was the computer keyboard, which logically evolved from the typewriter, archaic versions creating keypunches in cards. The video display terminal (VDT), which allowed users to see what information they were entering into the computer, greatly enhancing the generation, deletion, and editing of text, was not developed until the 1960s. 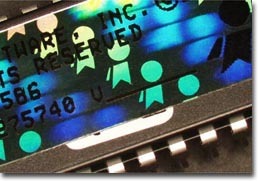 Soon after the introduction of this technology, pointing devices that enabled the selection of a specific location on a VDT screen were invented. The light pen was a popular early type of pointing device, but the mouse, which was invented in 1968 by Douglas Engelbart, became the dominant pointing technology when it was introduced as a primary means of input for the Macintosh, the first mass produced computer with a graphical user interface. Dragging and clicking on icons that corresponded to certain programs in order to activate them quickly became preferred to the former method of entering commands to direct the action of a computer. Other input/output devices that have found their way into widespread usage in modern times include modems, printers, joysticks, trackballs, audio speakers, optical scanners, sensitized digitizer pads, and electronic pens.